If you’re frustrated with your current banking experience, Simple may be the bank for you. The bank came about as a solution to high fees and inconvenient banking, so you won’t find any of that here. There aren’t any fees for account maintenance, overdrafts or out-of-network ATM usage. However Simple is limited in the account types that it offers, as well as its interest rates. You can open only one type of checking account which earns interest at the lowest possible rate. So if you’re looking for a variety of account types or hoping to earn interest with a high-yield savings account, look elsewhere. Simple began in 2009 when its founders decided to create a banking experience that’s uncomplicated and stress-free. They sought to eliminate the fees most often associated with a bank account and to help their customers feel more confident with their own money. The bank is based in Portland, with hundreds more employees throughout the country. With one checking account to offer, the bank pours itself into this account, providing convenient and helpful tools. You’ll have access to the Goals feature, which allows you to stash away funds for certain expenses like rent or your next vacation. The bank also offers a Safe-to-Spend® feature which helps you budget and spend responsibly and according to your actual income. You can also track each and every expense you make by logging them in your account with pictures, captions and even hashtags. Simple makes its checking account easily accessible, too, by not charging any fees for maintenance, overdrafts and more. Access to Your Checking Account Online, mobile and over the phone. If you’re looking for an easy checking account, the Simple Checking Account is a good option. The bank doesn’t charge any fees, not even for maintenance, overdrafts, transfers or card replacement. You also won’t be held to any minimum balance requirements. As long as you use Allpoint ATMs, you won’t see a fee from Simple. However, the ATM operator may still charge you its own fee. When you use your Visa debit card for foreign purchases, Visa will charge an International Service Assessment of up to 1% of the transaction value. Fee-free banking isn’t the only perk you get. Your account includes tools to help you track your spending with detailed reports, labels and even photos and hashtags. This allows you to quickly search your transaction history and understand Simple’s graphs, charts and other helpful features. That way you can easily see where you might be overspending. Then you can use the Goals tool to budget and save toward tangible expenses like rent or a new car. You can set an amount to save and a date you would like to save it by. The Goals tool will then automatically help you along toward those various goals. Plus, these funds are hidden from your Safe-to-Spend® number so you can’t use them for any unintended purposes. Finally, the Safe-to-Spend® tool helps you spend responsibly by budgeting your available balance, goals and scheduled payments. That way, you’ll always know exactly what’s safe to spend. 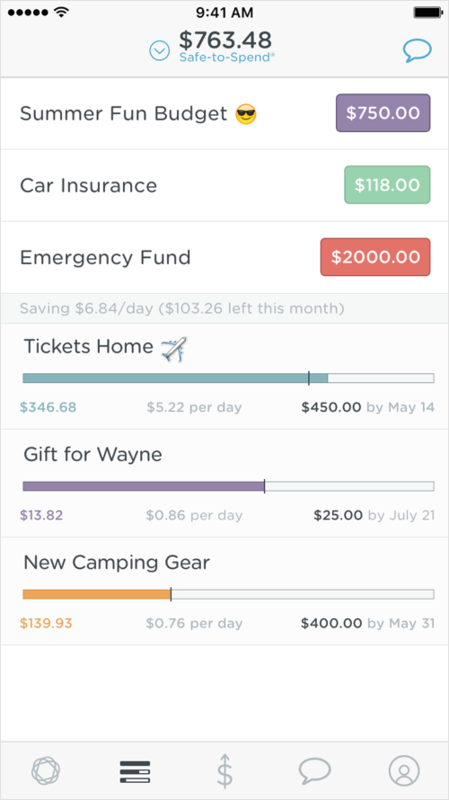 Simple makes saving and budgeting straightforward by putting these tools all together. Where Can I Find Simple? You can find Simple online, on mobile and at over 40,000 Allpoint® ATMs. You can download the optimized mobile app on both Apple and Android devices. You can also give the bank a call at 888-248-0632 to manage your money or ask any questions you might have. What Can You Do Online With Simple? You can do everything you need to do with your checking account online. Without any physical branches, the bank’s online and mobile presence is extensive, convenient and user-friendly. For starters, you can explore all the tools and perks that are included in the Simple banking experience. Then if you like what you see and want to open an account, you can easily apply by clicking the blue “Apply Now” button at the top of each page. Once you have an account, you can access it online by logging in with your username and passphrase. (Instead of a password, Simple has you create a passphrase, which is just a combination of four random words.) Then you can check on your transactions, set and edit your goals, manage your budget and more. For example, as shown in the accompanying image, you can look at all your savings goals and budgets on one page. You can see how close you are to reaching each specific one. Plus, you can also see your Safe-to-Spend amount at the top of the page. You can access your money online, on the bank’s mobile app, at an Allpoint® ATM or over the phone. To access your money online and on mobile, you’ll need to provide your username and passphrase. To use an Allpoint® ATM, you’ll use your Simple Visa® debit card. Once you’ve logged in online or on mobile, you can do everything you need with your accounts from checking on your transactions to sending money to your mom or paying your electric bill. Of course when you access your account at an ATM, you’ll only be able to make withdrawals and deposits. How Can I Save More Money With a Simple Account? Simple's checking account earn interest at a nominal rate set by its partner bank, The Bancorp Bank. This means that your money won’t really grow at a noticeable rate with Simple. However, the bank offers a number of special features that can help you save by managing your money more responsibly. For starters, the Goals tool helps you set aside funds for specific purposes from paying rent to buying a new car. The feature works like virtual envelopes to prevent you from spending the funds on the wrong expenses. Plus, you can track your savings toward those goals more easily than you could with a real envelope full of cash. Simple also includes a feature called Safe-to-Spend® which works as a budgeting tool that can tell you right away what you can afford. It takes into account the funds you have stashed away in your Goals, which you are not “allowed” to spend, your remaining balance and the cost of the purchase you want to make. That way, it can tell you whether you can responsibly spend that amount and keep you on track. 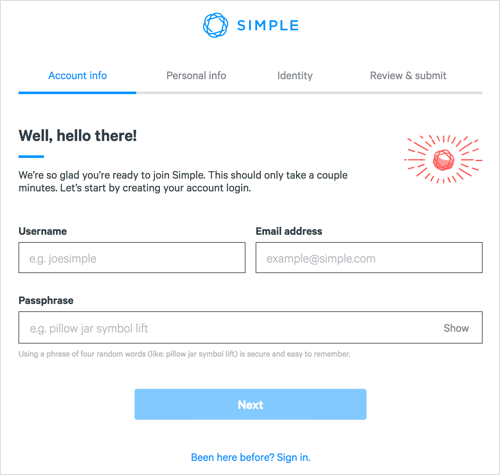 What’s the Process for Opening an Account With Simple? To open an account, you just need to visit the bank’s website and click the “Apply Now” button at the top right. You’ll then create a username and passphrase for yourself and enter your email address, as shown here. You will also need to provide information like your Social Security number and home address. The process should only take a few minutes to complete. If you’re not keen on the idea of online-only banking, Simple is likely not the right choice for you. The bank does not have any physical branches, which means you’ll mainly have to use your smartphone and your computer to manage your accounts. You will have access to over 40,000 ATMs, however. You also won’t be able to open a variety of accounts with Simple, since the bank offers only one checking account. If you’re looking to keep all your checking and savings accounts together at one institution, this won’t be the bank for you. Banking with Simple offers just that: a simple banking experience. There are no fees you need to worry about, nor any minimum balance and deposit requirements. You’ll have easy access to your account with the bank’s optimized website and mobile app. Plus, you gain access to a number of handy features, like Goals and Safe-to-Spend®, that help you manage your money responsibly.